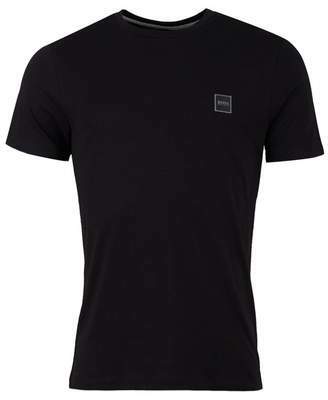 The BOSS Casual Tales Short Sleeved Crew Neck T-Shirt is a wardrobe staple piece to team with relaxed causals this season. Cut from pure cotton, sporting a crew neck, short sleeves and finished with an appliqued BOSS patch to the chest. Shop our BOSS Casual range to complete the look. 100% cotton Crew neck BOSS branding to chest Short sleeves Straight hemline Machine wash Size and Fit Size photographed: medium Pit to pit: 20"